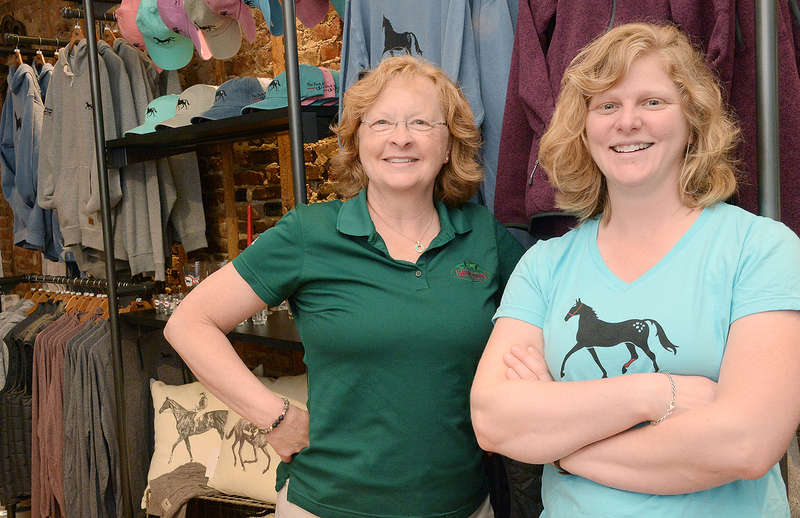 Maddy Zanetti, right, and Marianne Barker,stand in Dark Horse Mercantile, a new gift and apparel shop they opened in Saratoga Springs. They also own Impressions of Saratoga. The Dark Horse Mercantile, a gift and clothing shop, opened in June at 445 Broadway in Saratoga Springs. It is owned by Maddy Zanetti and Marianne and Dave Barker, co-owners of the popular Impressions of Saratoga on the other side of the street, at 368 Broadway. Zanetti came up with the idea after a trip to Key West, where she was struck by the ubiquitous “Black Cat” brand. She thought it would be great to develop a similar brand for Saratoga and her partners agreed. The line was selling well at Impressions of Saratoga. Zanetti said the partners had talked about opening another store sometime in the future, but had no immediate plans. When they saw the property next door to Coffee Traders was becoming available, they thought it would be a perfect They opened for business on June 16. Zanetti credited the staff at Impressions of Saratoga for getting The Dark Horse Mercantile ready to open on short notice. “They were really instrumental and have been a huge help. We are very lucky to have a very supportive staff,” she said. In addition to the T-shirts, sweatshirts, hats and ties with the Dark Horse logo, there is now a line of Under Armour clothing with the Dark Horse logo. The baby and children’s clothing line and products have also been expanded. They have expanded the glassware and gift items and they carry a few different chocolate brands that bear the Dark Horse name. Saratoga Chocolate Co. is supplying a chocolate bar called “Dark Horse” and Saratoga Sweets is supplying the shop with horse lollipops” made with dark chocolate. Other gift items include framed prints and mats of famous horses The store also has a miniature horse named Upset as its mascot with its own line of toys. Zanetti said that Upset will be making weekly appearances at The Dark Horse Mercantile throughout the summer and his scheduled visiting times will be posted on the shop’s Facebook page. Zanetti has also written a children’s book, “Upset, the Original Dark Horse,” illustrated by Gretchen Tisch. The book is available at The Dark Horse Mercantile. Summer hours at are 9 a.m. to 9 p.m. daily, and Sundays 10 a.m. to 8 p.m.